Note: Although all the benefits of chamomile tea listed in the following article have been scientifically tested by third parties, The Tea Company has not verified the validity of such studies and researches. Therefore, we can only share the information but we cannot offer any type of warranty as to the effictiveness of chamomile tea for any medical use. We can guarantee you, however, that we love drinking chamomile tea! Modern scientists from around the globe have confirmed through various studies and research the health benefits of chamomile. Chamomile tea contains chrysin, a flavonoid known for its incredible benefits for human health, and has outstanding properties as antioxydant, antibacterial, anti-inflammatory, antispasmodic, antipeptic, mild astringent, natural sedative an much more. Its medicinal use dates back to the times of the ancient Greeks, Egyptians and Romans, who would prepare it in the form of an infusion, hence the name “tea”, although it does not contain the camellia sinensis tea leaves. For this reason chamomile as a beverage is also referred to as a tisane, in the same ranks as rooibos and yerba mate. We have put together a number of ways in which chamomile tea was used by the ancients to treat various diseases and illnesses such as ulcers, irritation, wounds, burns, eczema, gout, bruising, mouth ulcers, canker sores, rheumatism, neuralgia, hemorrhoids and more. As one can imagine, at the time, one could not get the conveniently packaged chamomile tea bags at the supermarket. 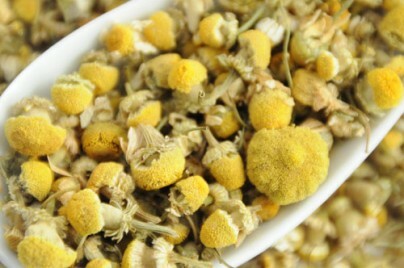 The chamomile tea then was made with fresh chamomile flowers. The benefits listed in the current article apply to fresh, loose chamomile flowers not so to the classic chamomile tea packed in the tea bags available at your local supermarket, since they are nowhere as fresh, have gone through intense processing and may contain chemicals such as pesticides, herbicides and other harmful chemicals. Chamomile tea is an exceptional drink to help soothe a stomachache. While it helps soothe the intestines, chamomile can promote better digestion, even those who suffer from IBS (irritable bowel syndrome). The extracts of chamomile flowers reduce the secretion of gastric acid, which can help fix an aching stomach. In addition, chamomile has been assessed as a digestive relaxant and has been used to treat various gastrointestinal disorders including flatulence, indigestion, diarrhea, anorexia, motion sickness, nausea and vomiting. The chamomile plant has no known adverse effect (except in case of allergies). It does not interfere with drugs and may be used safely with children.